“If your mind feels cluttered, clear off your desk.” Yes, that works - but what can you do to keep your desk clear? And can you spend the rest of your life clearing your desk and never getting any work done? I help you develop or fine-tune an information management system that keeps your desktop clear and your mind functional. So when you sit at your desk, you’re ready to work. We all process info differently, so there’s no single file system for everyone. I have experience with many different types that have a special appeal to different brain processing styles. Whichever system works best for you to find information, it will also help you keep your confidential information out of the reach of identity thieves. I’ll share the top ten tips for protecting your confidential information. easier to find and put away. Supplies are a big budget item. 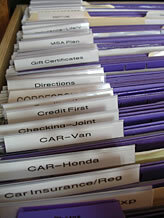 If your supplies are all over the place and you waste time searching for things that are missing in action (or you’ve run out of) I can streamline your inventory, ordering and storage so you can do your real job. Running out of space and don’t feel efficient? Think you need a bigger office? 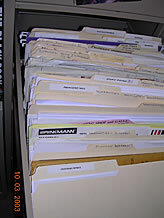 More file cabinets? After evaluating your operations, equipment needs and staff, I might make recommendations for additional office space or maybe just a new space plan that better meets your needs. Storage can be maximized with shelving above desks, under desks, taller shelving units and better organization within current storage. Even subtle changes can liberate you functionally and emotionally to get more done. A shared piece of equipment, like a printer, moved to a location that doesn’t distract the other person can make a big difference - not only in performance, but in office relations. Think you need to buy more file cabinets? Barbara Hemphill, author of the Paper Tiger books says that 80% of the paper we keep, we never use. I help people decide what information they need to keep and what they can find elsewhere when they actually need it.